It's time for another interview, and it's with my fantastic illustrator of my Jasmine Dreams book series- Jo Linsdell. I know everyone enjoyed reading my first one with George Cisneros, and I'm sure you're going to enjoy this one as well. I've worked with Jo since October 2013 on my book series. I had heard about her through Kathy Mashburn at a writers' meeting, and at that time I was looking for an illustrator. I was almost at the point where I didn't know if I would find someone. Kathy spoke highly of Jo and gave me her information at the meeting. Later that week, I messaged Jo via Facebook messaging , and I shared her my idea of my book. The rest is history, and so far we have collaborated on three books. She is really into social media: Twitter, Facebook, Google, and YouTube. She's a wife, mother, blogger, author, and an illustrator. She juggles so many things! I don't know how she does it, but she does. I hope she inspires you in your dreams as she has inspired me as a writer and blogger. Below are her social media links as well as her links to her websites. Please check them out and follow her on Twitter, Facebook, LinkedIn, and Google. Please tell me a little bit about yourself : where you're from and what are your hobbies. How did you end up in Italy ? I'm from the UK but moved to Rome, Italy, after coming here for just 3 days back in June 2001 and staying. My original plan had been to travel Europe for a few months but 3 days turned into weeks, then months... and well, I'm still here. The crazy thing is that I ended up in Rome by chance. When I was planning my trip (if you can really call it "planning". I decided just 2 weeks before my flight to do the trip), I couldn't make up my mind where to start and so I opened an atlas, closed my eyes, and pointed at the page. My finger was on Italy and so I figured I'd start with the Capital city and booked my flight for Rome. Two weeks later I was on a plane wondering if I was brave or stupid. Truth be told, I think the honest answer was a bit of both. The big deal closer, and main reason I'm still in the Eternal City, is that I met my now husband at Piazza di Spagna. Together we have two wonderful little boys. When I'm not busy being a wife and mummy, I like to be creative. Even after all these years I still class writing a hobby as well as part of my job. I would do it even if it wasn't my job. The same for drawing and other arty projects. Writing, sketching, painting, crafts... it's all part of who I am. I'm just lucky that I can earn money from my hobbies. I've recently rediscovered my love of fitness. Working out is part of my daily schedule again now. I like to keep it fun though and often involve my kids. We do yoga together, and play Zumba or Dance 4 on the wii. I also do fitness challenges (motivated by my new blog www.theMumClub.com). As I workout from home I find they give me focus and help keep me motivated. When I get the chance I also love going for bike rides. I know you're an illustrator as well as an author of children books and non-fiction books. Which book was your favorite to write and why? Now that's a tough question. Each of my books has a special place in my heart. I think it would probably have to be "Out and About at the Zoo" though. I wrote the book for my eldest son when he was little. 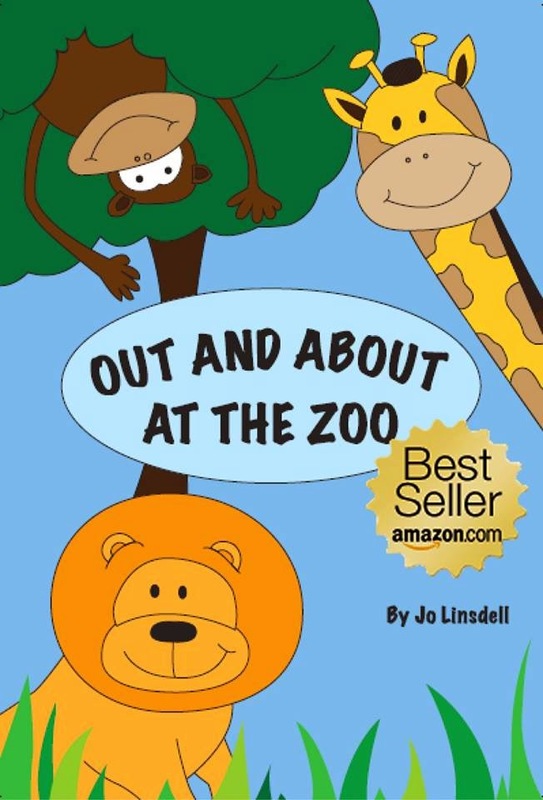 It was based on the first time I took him to the zoo and so the things that happen in the book actually happened. It was also the first children's picture story book I published and so marks a milestone in my career too. It also happens to be my all time best seller too. How many kidlit books have you illustrated? Do you have a favorite character that you've illustrated and if so why? I've illustrated over 10 published kidlit books now and I'm currently working on more. My favorite character is actually from a book that I'm working on at the moment called "The Bedtime Book". The character is the little boys teddy bear. I don't want to give too much away, but he has lots of fun joining in the adventures with the little boy. I'm not really sure what it is that makes me love him so much. I just do. Hopefully my readers will feel the same. When did you start drawing/sketching ? Since I could hold a crayon. I've always loved art. Art and Design was one of my favorite lessons at school. I find sketching relaxing and so I'm always doodling, or sketching something. It's always been part of my life. Do you prefer illustrating over writing? It depends on my mood. Sometimes I get in my writing zone and it's the best. Other times I get in my illustrating zone and that's the best. I love them both and can't imagine my life without either of them. Do you have a favorite genre that you write and why? There's something special about each of the genres I write. For example, I love writing children's books because I can include my kids in the process. Also knowing that you played a part in starting someone's love of reading is pretty special. Having a kid say "read it again" after finishing one of my books is priceless. My non fiction books are special too. I like helping others and through these books I do. Knowing I helped someone else achieve something is a good feeling. At the moment I'm working on finishing my first novella. It's pure chick lit and so much fun to write. It's also completely different from the work I've published to date. It's allowing me to go to places with my writing that I've not been to yet. Did anyone influence you or inspire you to be a writer ? Pretty much every book I've ever read. Writers have always had a kind of super hero status in my mind. What do you love about being a writer ? Any drawbacks ? I love creating something from nothing. Writing, for me, is also a way to vent my emotions. I love that I can do my job from any where and at times that suit me. I love how writing helps me grow as a person and discover new things about myself. I think the biggest drawback of being a writer is that you never fully switch off. Even when you're not writing, you're thinking about writing. Ideas can even get into your dreams as you sleep. It's a 24/7 job. I have very wide tastes in books. Some of my favorites include Sophie Kinsella, Dean Koontz, and Ethan Cross. I'm working on several projects at the moment. Non fiction, children's books, and other genres too. I'm also working on some ecourses. I'm really excited about this new venture and have plans for lots more in the future too. What advice would you give to an aspiring writer or illustrator ? Don't be afraid to try new things. Experiment and have fun with your work. Do what you love. Write/illustrate so that you are happy and enthusiastic about your work. That energy will show in what you produce. Never stop learning. Whether you're writing or illustrating, you will never become a master of your craft. Both are a process. You improve with practice but never know everything there is to know about the craft. They are a journey of self discovery that never ends. Also remember that not everyone will like your work, and that's OK. You're not doing it for everyone. You're doing it for you. You're doing it for your target audience. I know you enjoy social media. Which one do you prefer -Twitter, Facebook , Pinterest? And why ? I'm a total social media junky! I started out back in the days when MySpace was the number one place to be and now I'm every where. I use each platform differently and for different reasons so picking a favorite is hard. Facebook is best for connecting with friends, family, and strengthening relationships. Twitter is best for branding, and making new connections. Google+ is good for SEO. Pinterest is fun and great for research and inspiration. How do you juggle being a wife , Mom, blogger /writer and illustrator ? I imagine you're busy from sunup till setting of the sun. I'm a good multi-tasker ;) I am always busy. I like it that way though. When I'm not it doesn't feel right. I work a lot. As I love my work though it doesn't feel like work most of the time. I'm just doing what I love. I'm pretty good at organizing myself. I keep editorial calendars for my blogs and schedule posts in advance. I'm a big fan of the 5 minute system. It's where I set a timer for 5 minutes and see how much I can get done. I do this for cleaning the house but also social media tasks. It's amazing how much I can get done in just 5 minutes if I focus. I make sure I get work done when the kids are at school or in bed so that when they're with me I can concentrate on them. I also make sure I make time for seeing friends. A quick coffee and a chat helps keep balance between work and play. It's not always easy to juggle everything but it is possible. 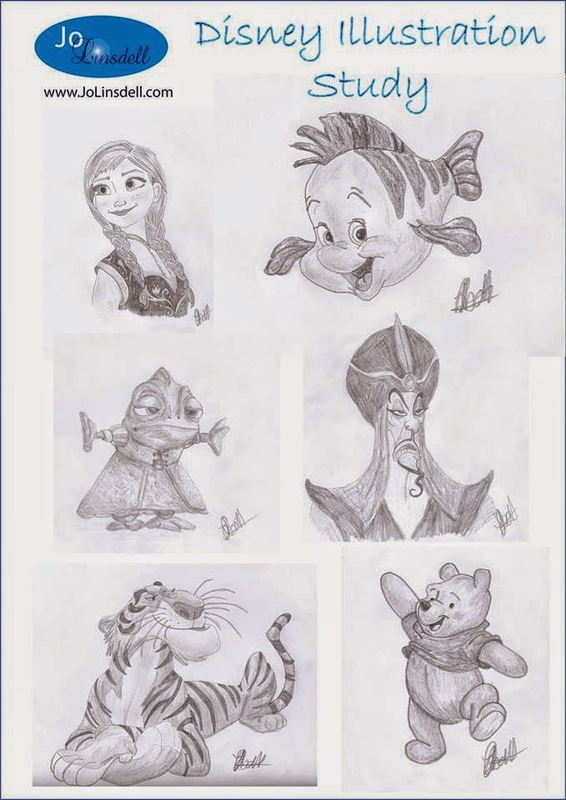 Jo does some fantastic sketching of Disney characters. 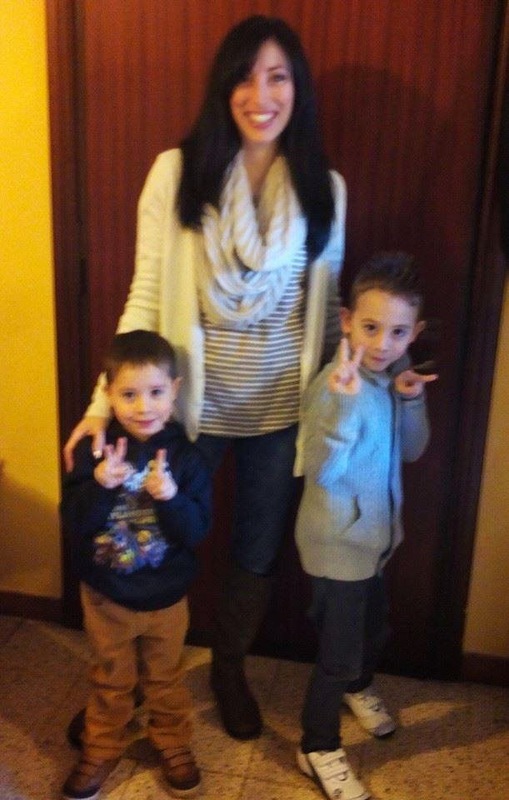 Jo with her sons Matteo and Lorenzo. 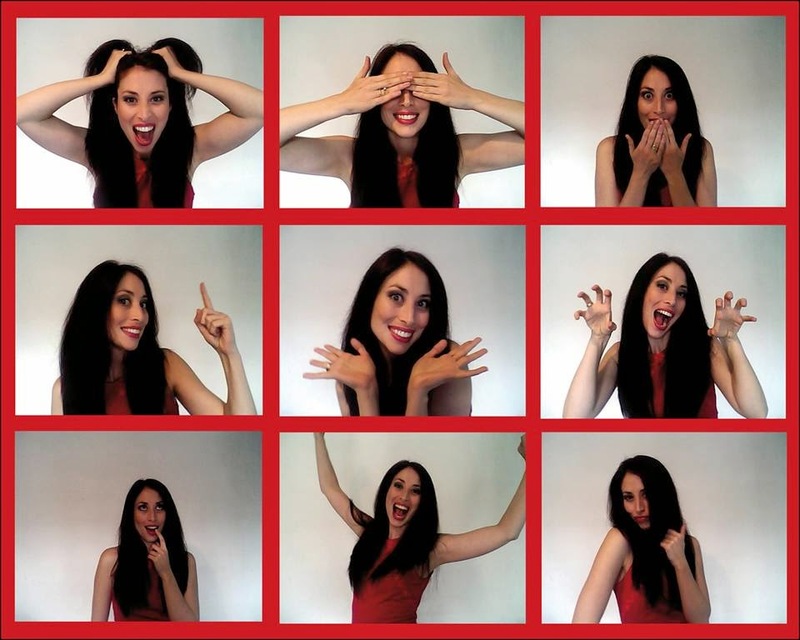 The many expressions of Jo..love this! I hope you enjoyed this my newest interview with Jo Linsdell. I already know so much about her, but I definitely learn more after interviewing her.